Hartlip Place is a fine listed Georgian house set in four acres of gardens and woodland on the outskirts of the village of Hartlip on the edge of the North Downs. It was built in 1812 by William Bland and retains many of its original features. It is only a short drive from the M2 and the M20 which makes it an ideal location for guests from all areas of the country. There are many places nearby to visit including Rochester, Canterbury, Leeds Castle and Whitstable to name but a few. We are a perfect stopping off point if you are visiting the continent as we are only 40 minutes from Dover and the Eurotunnel at Folkestone, 30 minutes from Eurostar and 45 minutes from Gatwick. 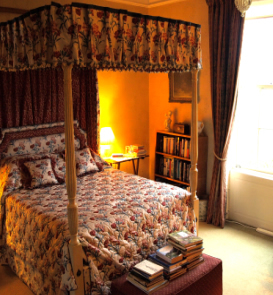 The Four Poster Room, overlooks the front gardens, has a beautiful four-poster bed, the luxury of an open fire in winter, and a large en-suite bathroom. 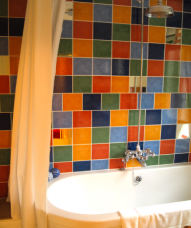 The Indian Room is a large sunny room with a private bathroom just across the corridor, which has recently been refurbished. Dinner is available, by prior arrangement, from £25. Copyright Hartlip Place 2008 All rights reserved.